Tomoe Mami is a rookie Magical Girl, whose philosophy differs from her allies when it comes to fighting the Witches who prey upon Humanity. While she does what she must to ensure peoples lives are saved, her life has felt lonesome since she became a Magical Girl, and what she desires most is a friend. Then one day she meets a girl named Sakura Kyouko; a spunky young girl inexperienced at Witch hunting. Is this fellow magical girl a reliable ally, and even more, could she be the friend Tomoe Mami has longed for? Coming out of the tv anime and films, I thought that the story told was airtight for what it set out to accomplish, and did an excellent job at giving you the feeling that this story takes place in a tangible but mysterious world, and that there was a potential for there to be a lot of story out there that hasn’t been told. That being said, while the motivations of these characters made sense given what backstory you were given in the anime, Kyouko and Mami were still given the least attention of the quartet, and I was stoked to find out that more was explained in this series of manga volumes. As far as I’ve read or heard, this story is canon, and it doesn’t do anything that would have me believing otherwise, which is a huge plus, and I’m happy with what details this manga gives us as to who these two girls were and what they were like before what took place in the anime, but with that being said, I would have liked to have seen more. 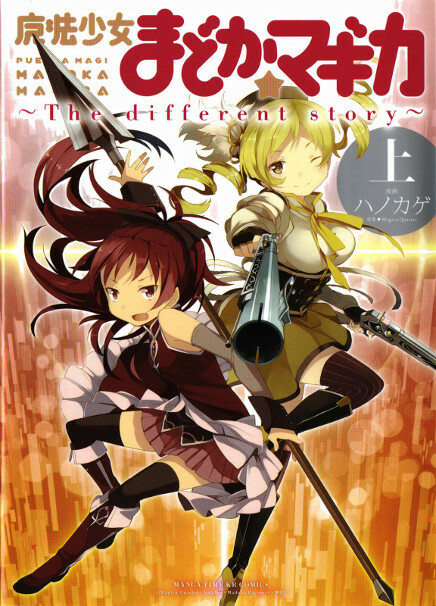 The first volume is about 150 pages, and while it informs you of the types of people Kyouko and Mami were in their early days fighting Witches together, which was quite interesting and enjoyable to read and leads you up to the present day (of around the spot where the anime begins), it doesn’t give you as much backstory as I would have hoped for. Kyouko is maybe my favorite character in the series, and just seeing how she behaved and saw the world before her contract with Kyuubey made it well worth the read, not a whole lot is told here that you didn’t already know coming out of the anime, and this is even more-so the case with Mami, whose background is briefly explained here but not much else. The art is clean and detailed, and the new designs for Kyouko and some of the supporting characters are all terrific. I thought some of the action scenes were a little difficult to follow, but the story told here is perfectly coherent (if you’ve already seen the anime), wraps up nicely, and has me curious to see where the second volume goes. I wouldn’t recommend this series to anyone who is unfamiliar with the story told in the anime just because things related to the nature of the world aren’t explained in detail here, but if you’re a fan of the series, and especially if you have a soft spot for Kyouko or Mami, I highly recommend you check it out.